This month’s TBR Challenge theme was “All About the Hype”. I did try to read a different book, Hate F@*k by Ainsley Booth, but that ended up not working for me despite a promising beginning. My DNF review of that is here. So I’m not writing about that. Instead I’m writing about Magic Bites by Ilona Andrews. A little over a year ago, I asked a friend for some urban fantasy recommendations to help me branch into other romance sub-genres. I was in a historical romance slump at the time, having consumed Mary Balogh’s entire backlist over the course of a month or two. Ilona Andrews was one author my friend recommended and since getting that first rec, I’ve seen this series on basically every list of urban fantasy everything for the last 18 months. Does that count as hype? Just starting the series was a hurdle for me though. Any time a series has gotten to (I think?) eight books, it just feels like a commitment to start the first one. So I was quite pleased that I enjoyed it as much as I did. If you’re not familiar with the series yet, Kate Daniels is a magic-using mercenary whose guardian has just been murdered. It’s a fantastic opening for a story because we understand right away is that what Kate wants is to catch Greg’s killer. It gets the plot moving right off the bat and isn’t so complicated that we have to understand a lot about her before getting to the meat of the book. Of course, we know it’s not going to be that simple. Over the course of the investigation, we meet The People (drivers of mindless vampires), The Pack (shapeshifters) and The Order of Merciful Aid (knights who protect the public from magical interference). The world rides waves of both magic and technology. When magic is up, tech is down, making for an interesting environmental state for the story. We also meet Curran, the leader of the shapeshifters, who seems to be the love interest for the series, though of course I can’t be sure one book in. 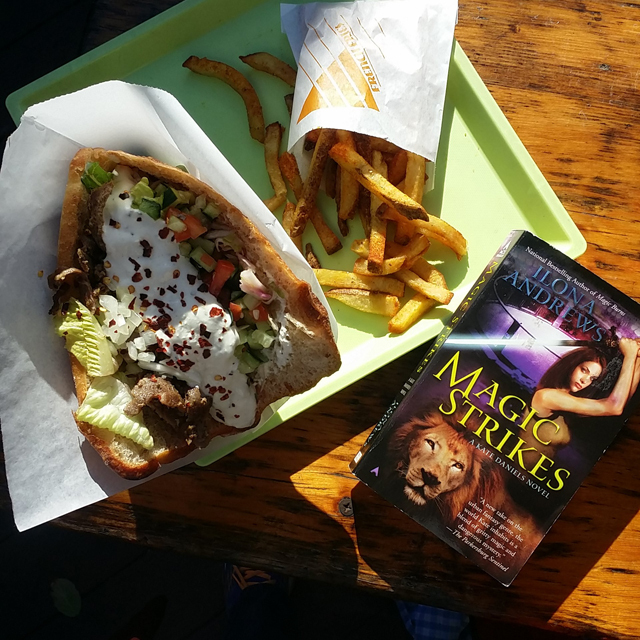 Magic Bites is definitely a “first book in a series” kind of book. Particularly with urban fantasy, there’s a lot of world-building, ramping up, establishing of rules and relationship development. But there is the murder plot to carry this book and even if it’s not as brilliantly complex as I suspect this writer could be, it was enough to keep me plowing through. It’s certainly better than the first Dresden Files book, which was seriously awful. Actually, the first three Dresden Files books were pretty awful, though that series does improve immeasurably. So this is a better series start than that one was. Plus Kate is delightful. She’s snarky, sarcastic and can’t keep her mouth shut, even when she really should, just like Dresden. I love that she’s allowed to cause herself problems and that all the conflict isn’t imposed from the outside. I also enjoyed the exploration of her power. She hides what she knows and what she can do because it’s safer for her that way. It seems analogous to our world in that women aren’t always allowed to work to their potential, having to carefully phrase their thoughts and ideas so as not to offend anyone. Kate certainly isn’t worried about offending anyone, but it will be interesting to see as the series develops whether she she is allowed more full expression of her talents without her overarching fear of standing out getting in the way. I’m quite glad I read Magic Bites and intend to immediately proceed to the next book, Magic Burns, which should tell you how much I enjoyed this one. It’s been a while since I’ve binged a whole series all once (Kit Rocha’s Beyond books last fall, I think), but Kate Daniels definitely seems binge-worthy. If the length of the series has been putting you off as well, I’d say go for it. It’s a strong opening gambit to a series that apparently only gets better. Oh, this review makes me want to read more urban fantasy again! I read a fair amount of it years ago, but got burned out a little along the way. I just started the Kate Daniels earlier this year. I was hesitant due to the series size and all the hype surrounding it as well. But, like you, I am glad I finally started on it. Kate is one of my all-time favorite heroines and Curran makes me…feel things. Book 3 is where the authors hit their stride and I became hopelessly hooked on Kate and Curran–as well as the incredibly imaginative cast of secondary characters. Recently I listened again to the entire series splendidly narrated by Rene Raudman. It just gets better and better!